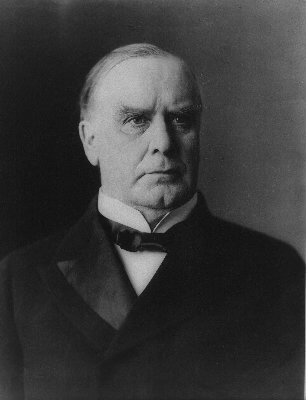 President William McKinley signed legislation creating Mount Rainier National Park in central Washington. The nearly 365-square-mile area of pristine forests and spectacular alpine scenery was the fifth national park designated by Congress. Called Tacoma (or Tahoma) by generations of Northwest Native Americans, Mount Rainier was named after Admiral Peter Rainier in 1792 by English explorer George Vancouver, who sighted the enormous 14,410-foot volcanic peak while exploring Puget Sound. Nearly a century later, famed naturalist John Muir visited the Rainier region and later recommended that it be designated as a national park. Muir was particularly impressed with the magnificent wildflowers that blanket the mountain during the warm months of the year. Mount Rainier National Park was the nation's fifth national park. Established by an act of Congress in 1899, it followed Yellowstone in 1872 and Yosemite, Sequoia, and General Grant National Parks in 1890. Mount Rainier had a significant part in the founding of the National Park System. Even more than the three California parks which preceded it, Mount Rainier National Park served to differentiate the idealistic purposes of national parks from the more utilitarian functions of national forests, or "forest reserves" as they were known at the time. As the first national park established after the founding of the national forest system in the 1890s, Mount Rainier demonstrated that the emerging national park idea was not to be subsumed by the burgeoning conservation movement, whose central goal was to increase efficiency in the use and development of the nation's resources. The establishment of Mount Rainier National Park reaffirmed the nation's intent to set aside certain areas of outstanding scenic and scientific value for the enjoyment of present and future generations. The arguments that were marshalled in support of Mount Rainier National Park during the 1890s helped shape the national park idea at a crucial time. The legislation which established the park was in some ways precedent-setting. Mount Rainier was the first national park to be created from lands that were already set aside as forest reserves, forming a precedent for numerous national parks established in the twentieth century. Lands within the park boundary which had been granted to the Northern Pacific Railroad Company were reclaimed under the act in order to make the national park whole. This insistence on federal ownership of the land became another hallmark of American national parks in the twentieth century. In other respects, the act which created Mount Rainier National Park followed the Yellowstone prototype and reinforced an emerging pattern of national park legislation. For these reasons, it is appropriate to examine the origins of Mount Rainier National Park in a national context. It needs to be noted, however, that the founding of Mount Rainier National Park was very much a local affair. Unlike the campaign for Yellowstone National Park, much of the impetus for the park came from the local populace. Local mountaineering clubs, newspaper editors, businessmen's associations, and University of Washington faculty all voiced support for the national park. Without their sustained interest, it is doubtful that Washington state's senators and congressmen would have shown such perseverence in pushing the legislation through Congress. After 1900, Seattle and Tacoma businessmen were unusually aggressive in seeking congressional appropriations for the park. Seattle and Tacoma pleasure-seekers increasingly traveled to the park by automobile, establishing a pattern of visitor use in Mount Rainier National Park that would persist throughout the twentieth century. Thus the park's founding years also reflect the growing influence of Seattle and Tacoma on their western Washington hinterland. The campaign for Mount Rainier National Park cannot be neatly characterized or narrated. It involved many disparate elements. No single figure stood out as the leader of the campaign, nor did any single organization coordinate it. A handful of scientists who had had personal experience with Mount Rainier might be considered the driving force behind the campaign. They were scattered all around the nation, knew each other professionally, and used the opportunity of professional meetings to form committees and prepare memorials to Congress setting forth the reasons for a national park. A few dozen mountaineers, most of whom resided in the Puget Sound area, could also be considered the driving force behind the campaign. It was largely due to their infectious enthusiasm for the mountain, which they communicated through public talks and letters to the local newspapers, that Washington state's senators and congressmen came to view the national park campaign as a popular cause. The Northern Pacific Railroad Company could also be credited with helping to spawn the park idea in 1883 and finally bringing the national park legislation to fruition in the late 1890s. Its shadowy role in the long legislative history of the bill was crucial in the end. The campaign was also prolonged. In a loose sense of the term the "campaign" dates from 1883, when a party of prominent Europeans traveled via the Northern Pacific Railroad to Wilkeson and the Carbon River area, and afterwards urged that the mountain and its glaciers be set aside as a national park. Nothing came of this early proposal, however, and if the campaign is viewed as a concerted effort to push the idea in Congress, it really dates from the summer of 1893. Most of the arguments in support of the national park were advanced around this time. In still another sense, the campaign reached its crucial phase at the end of the decade, when some political horse-trading gave the establishing act its specific form. National park historian Alfred Runte has described the "pragmatic alliance" which the western railroads formed with the national park movement. Railroad company officials saw a potential for increased passenger revenue as the federal government began to establish national parks in the West. Railroad companies lobbied for national park bills, financed and operated national park hotels, and promoted tourism to the parks. In return, national parks attracted tourists from the eastern United States who might otherwise spend their leisure time in Europe. The association of national parks and railroads also improved the railroad companies' public relations. The Northern Pacific was the first railroad company to cultivate this partnership. As early as 1871, farsighted promoters of the Northern Pacific took an active interest in the legislation to establish Yellowstone Park, although it was not until 1883--the year that the transcontinental was completed--that the railroad offered service to Yellowstone via a short spur in south central Montana. That same year, the Northern Pacific began to promote the scenic attractions of Mount Rainier. 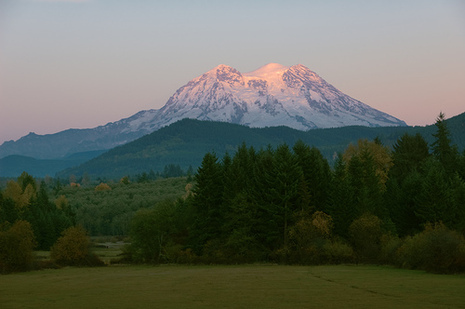 It announced in its March issue of Northwest Magazine that it would henceforth use the Indian name Mount Tacoma in all its publications, and it followed this with an article on Mount Tacoma in its April issue written by geologist Bailey Willis. As a further part of its publicity campaign, the Northern Pacific invited a party of distinguished gentlemen from England and Germany to accompany Willis on an excursion to the Carbon River highcountry on the northwest flank of Mount Rainier. The party included Professor James Bryce, a writer and member of the British Parliament and Professor Karl von Zittel, a geologist. Duly impressed, these gentlemen returned the railroad's favor by putting their good names behind the first proposal for Mount Rainier National Park. They exclaimed over the glacier and woodland scenery of Mount Rainier in a public report which concluded with the hope "that the suggestion will at no distant date be made to Congress that Mount Rainier should, like the Yosemite Valley and the geyser region of the Upper Yellowstone, be reserved by the Federal Government and treated as a national park." That same summer, Senator George F. Edmunds of Vermont also took advantage of the new railroad connections to make a trip to Mount Rainier. "I would be willing to go 500 miles again to see that scene," the senator wrote in the Portland Oregonian. "This continent is yet in ignorance of the existence of what will be one of the grandest show places, as well as a sanitarium." The sponsorship of these trips was as visible a part as the Northern Pacific would ever take in the campaign for Mount Rainier National Park. It campaigned for the park through surrogates, and it later lobbied the Congress for an amendment to the park bill through discrete channels. Its role can be inferred but not directly documented. The company's surreptitious approach is easily explained. The Northern Pacific had received an immense land grant in Washington, which included the area of Mount Rainier. It had managed to retain the land grant in spite of many delays in the construction of the railroad and dubious modifications of its charter. The people of Washington deeply resented this and suspected that the company had used corrupt means to hold onto the land. Whatever genuine interest the Northern Pacific might have in scenic preservation, therefore, local people would inevitably see its support of a national park as nothing more than a greedy ploy to exchange worthless property in the Cascade Mountains for valuable timber land elsewhere. Consequently, the Northern Pacific had no overt role in the Mount Rainier National Park proposal. When the suggestion of a national park campaign in 1883 went nowhere, the Northern Pacific seems to have retired from the field. Yet the Northern Pacific was not irrelevant to the campaign that began in 1893 and eventually succeeded with the establishment of Mount Rainier National Park in 1899. The link between the Northern Pacific's stillborn park proposal in 1883 and the campaign in the 1890s was the former Northern Pacific geologist, Bailey Willis. Born in 1857 in Idlewild-on-Hudson, New York, the son of poet Nathaniel Parker Willis, he attended a boarding school in Germany and Columbia University in New York, where he received degrees in mining engineering and civil engineering. In the early 1880s, the Northern Pacific employed Willis to search for coal deposits north of Mount Rainier, introducing the young man to a wilderness country that claimed his interest for the rest of his life. During these years Willis cut a trail up the Carbon River to Spray Park, and as noted above, led the Northern Pacific's party of dignitaries into the Carbon River highcountry in 1883. Willis joined the U.S. Geological Survey in 1882. He was still with the Survey in 1893 when he renewed the proposal for Mount Rainier National Park at the annual meeting of the Geological Society of America, held that year in Madison, Wisconsin. The Geological Society of America appointed a committee to memorialize Congress about the need to establish a national park around Mount Rainier. This marked the beginning of the successful national park campaign. The campaign quickly gained support from many quarters. At a meeting of the American Association for the Advancement of Science, also in Madison, another committee was formed for the same purpose. Two months later the National Geographic Society, meeting in Washington, D.C., appointed a committee on the Mount Rainier National Park proposal, and over the winter of 1893-94 both the recently-formed Sierra Club and the Appalachian Mountain Club, meeting in San Francisco and Boston respectively, formed like committees. These five committees combined their efforts in preparing a detailed memorial to Congress setting forth the reasons for the national park. This was the nucleus of the national park campaign. The first thing that stands out about this movement was the strong showing of scientists, particularly geologists. The Geological Society of America's committee consisted of three esteemed geologists in the U.S. Geological Survey: Dr. David T. Day, Samuel F. Emmons, and Bailey Willis. Day's prior connection with Mount Rainier, if any, is unknown. Emmons had climbed Mount Rainier in 1870 with A.D. Wilson--the second successful ascent of the mountain--at the conclusion of the Geological Exploration of the Fortieth Parallel, and had written a report on the volcanoes of the Pacific Coast. A protege of the first director of the U.S. Geological Survey, Clarence King, Emmons was head of the Survey's Rocky Mountain Division from 1879 until his death in 1911. Bailey Willis had explored the northwest side of Mount Rainier in the early 1880s while looking for coal deposits for the Northern Pacific. He would subsequently make the first reconnaissance of Mount Rainier's glacier system with Israel C. Russell and George Otis Smith in 1896. A specialist in mining geology, Willis's career with the USGS spanned from 1882 to 1915. The American Association for the Advancement of Science, meanwhile, included two geologists on its committee: Russell, who had recently left the USGS to take a professorship at the University of Michigan, and Major John Wesley Powell, the USGS's current director. The USGS's support of the national park proposal was crucial, for it gave credibility to the argument that the area around Mount Rainier contained no significant mineral wealth. Other scientists on the AAAS's committee included Professor Joseph LeConte, a botanist; Bernhard E. Fernow, chief of the Forestry Bureau; and Clinton Hart Merriam, chief of the Biological Survey. This was a roll call of the politically powerful scientists of the day. The National Geographic Society committee took the lead role among these organizations. The committee chairman was the president of the Society, Gardiner G. Hubbard, and its other members included Washington Senator Watson C. Squire, John W. Thompson, Mary F. Waite, and Eliza R. Scidmore. Squire introduced a park bill in the U.S. Senate on December 12, 1893. Hubbard hosted several of Squire's Senate colleagues at a National Geographic Society dinner at his home, where they were regaled with lantern slides and a lecture by veteran Mount Rainier climber Ernest C. Smith. The second notable feature of this campaign roster is the partnership of the scientific organizations with the mountain clubs. Men and women who had been to the top of Mount Rainier enjoyed great stature in the park movement and provided much of its drive. The two mountain clubs' committees included four individuals who had climbed Mount Rainier. Philemon B. Van Trump of the Sierra Club had accompanied Hazard Stevens on the first successful ascent of Mount Rainier in 1870. George B. Bayley. another member of the Sierra Club, had climbed the mountain with Van Trump and James Longmire in 1883. John Muir, founder of the Sierra Club and chairman of the committee on Mount Rainier, had made the ascent with Edward S. Ingraham of Seattle in 1888. The Appalachian Mountain Club committee included Ernest C. Smith, a Tacoma clergyman who had climbed the mountain with Ingraham in 1888 and two years later had led the party that included Fay Fuller, the first woman to make the ascent. All of these individuals campaigned for the national park by writing articles and giving lectures on Mount Rainier. Their involvement in the campaign underscores how much the Mount Rainier National Park idea was rooted in the physical and aesthetic experience of climbing the mountain. This is the point which Aubrey L. Haines makes convincingly in Mountain Fever: Historic Conquests of Rainier (1962). The third significant feature of this campaign was its timing. The impetus for the campaign was the proclamation by President Benjamin Harrison on February 20, 1893 of the Pacific Forest Reserve. The Pacific Forest Reserve embraced an area approximately forty-two miles long by thirty-six miles wide, centered on the crest of the Cascade Mountains. To the dismay of preservationists, this left Mount Rainier at the extreme western edge of the reserve, with its western glaciers extending outside the boundary. Moreover, some preservationists were skeptical about whether the forest reserve designation would afford Mount Rainier adequate protection from vandals or bring the desired government expenditures for road development. The purpose of the forest reserve was to protect timber and watershed values, not scenic values. Publicity on the Pacific Forest Reserve's shortcomings inspired the campaign for a national park. Local newspapers and mountain clubs in Seattle and Tacoma brought this issue into focus. Mount Rainier enthusiasts in the two cities were alert to these problems because they had been involved in an increasingly impassioned discourse on Mount Rainier for the past four to five years. Not only did the name of the mountain excite debate between the two cities, but other controversies involving Mount Rainier raged in the newspapers and mountain clubs: complaints about the appropriateness of new place names introduced on a map of Mount Rainier by Fred G. Plummer of Tacoma, dubious claims that Lieutenant August V. Kautz had attained the summit in 1857, and allegations of vandalism to trees by campers in Paradise Park. The rivalry between the two cities even caused a schism in the Washington Alpine Club, with Tacomans forming their own Tacoma Alpine Club in 1893. As parochial as these issues seemed, they set the stage for the national park campaign. Between 1890 and 1893, Van Trump, Plummer, and various other local Mount Rainier enthusiasts proposed a national park, but their ideas got no further than the local newspapers. With the proclamation of the Pacific Forest Reserve on February 20, 1893, the area finally achieved the national recognition that these local interests coveted. Within a year of the proclamation, a national park bill was before Congress and petitions from the faculties of the University of Michigan, University of Wisconsin, and University of Washington were sent to Congress in support of the bill. Between 1893 and 1898, Washington State's senators and congressmen introduced legislation in six consecutive sessions of Congress looking to establish a "Washington National Park." The long and bumpy road which this legislation traveled in Congress is revealing of the apathy and skepticism which confronted preservationists prior to the turn of the century. There was little organized opposition to Mount Rainier National Park on the part of grazing or mining interests. Rather, the legislation languished for five years primarily because Congress could not be persuaded that it was the responsibility of the federal government to create a national park like Yellowstone in the state of Washington. The establishment of Mount Rainier National Park in 1899 helped launch a national park system. It would be followed by Crater Lake (1902), Wind Cave (1903), and Mesa Verde (1906). The long time getting this bill through Congress was significant for another reason. Experience has shown that the longer Congress deliberates on a national park bill, the more exceptions and qualifications are apt to be attached to it. The Mount Rainier National Park Act exemplifies this pattern. In most ways, the bill that Congress passed in 1899 was weaker than the original bill introduced in 1893. To follow the legislation's permutations through six sessions of Congress is to highlight the growing strength of opposition to the park. This is important in understanding what might be termed, from a partisan standpoint, the national park's "birth defects." On December 12, 1893, Senator Watson C. Squire introduced S.1250, a bill to establish a "Washington National Park." The bill essentially sought to redesignate the Pacific Forest Reserve as a national park. The boundaries of the park described in Squire's bill were no different from the boundaries of the reserve. Like many others in his home state of Washington, including Seattle's Chamber of Commerce, whose memorial he submitted together with the bill, Squire believed that President Harrison had proclaimed the Pacific Forest Reserve the previous February with a view to its subsequent conversion to a national park. Squire's bill was referred to the Senate's Committee on Public Lands. Three weeks later, on January 4, 1894, Representative William H. Doolittle introduced an identical bill in the House (H.R. 4989), which was referred to the House's Committee on Public Lands. On July 10, 1894, seven months after submitting S.1250, Squire introduced S.2204, which differed from the earlier bill only in its boundary description. The new boundaries followed exactly the recommendations of the joint committee of the Geological Society of America, the American Association for the Advancement of Science, the National Geographic Society, the Sierra Club, and the Appalachian Mountain Club. The new boundaries added to the park the western flank of Mount Rainier and eliminated from the park all that portion of the Pacific Forest Reserve east of the Cascade Crest and south of the Tatoosh Range, together with a narrow strip along the north. The reason for the addition was obvious; the deletions, Squire explained to the Senate, were designed to exclude from the park all coal, gold, and minerals which were supposed to exist. It was at this time that Squire made his one significant speech to the Senate on the Washington National Park. The speech mostly drew upon the joint committee's memorial. It elicited no debate of the national park bill on the Senate floor. Neither of Squire's bills nor Doolittle's bill were reported back from committee. Doolittle failed to introduce a second bill along the lines of S.2204, and the discrepancy between the House and Senate versions no doubt hurt the legislation's chances. For some reason, Squire and Doolittle did not resolve this discrepancy when each of them introduced new Washington National Park bills early in the first session of the fifty-fourth Congress, in December 1895. These two bills (S.164 and H.R.327) likewise died in committee. It is unclear whether the lack of coordination between the two Washington State members of Congress was due to oversight or disagreement. In any case, after Doolittle heard from the Committee on Public Lands that his bill would not be approved, he introduced another, H.R.4058, which further constricted the boundaries. Doolittle's bill drew the boundaries inward on all sides, and reduced the size of the park from approximately twenty-four miles by twenty-six miles to approximately eighteen miles square. These were the boundaries described in the Mount Rainier National Park Act as finally enacted. Doolittle's H.R.4058 deserves close analysis, because it became the blueprint for the eventual Mount Rainier National Park Act. In addition to the new boundary description in Section 1, H.R.4058 included two new sections. 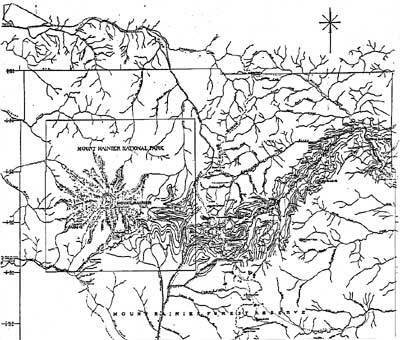 Sections 3 and 4 provided that the Northern Pacific Railroad Company's grant lands which fell within the national park would be cancelled, and that the company would be able to select an equivalent number of sections in lieu of these lands in any state served by the railroad. The generous concessions made to the Northern Pacific strongly suggest that the railroad company influenced this legislation by one means or another, though company officials would vigorously deny this for years afterward. The generous consideration given to the Northern Pacific's interests was embarrassing to the bill's supporters. To the preservationists' chagrin, the new boundaries cut some three hundred square miles of forest land out of the park. What angered so many citizens, however, was not the park's diminished size but the fact that the legislation paid for the Northern Pacific's land inside the park with public domain timber lands elsewhere (mostly in Oregon, as it turned out, much to the ire of the people of that state). This was too good a deal to have been achieved without bribery, contemporaries assumed. Certain proponents of the bill were roundly criticized for the provisions covering the Northern Pacific land grant, and Washington's Senator John L. Wilson and Congressman James Hamilton Lewis, who shepherded the legislation through the next four sessions of Congress, had to answer for it in their reelection bids. Whatever the railroad's precise role in seeing the legislation through Congress, its effect was to cast a pall over the act. The lesson of the Mount Rainier National Park Act appeared to be that in any "pragmatic alliance" between western railroads and preservationists, the railroads would exact considerable tribute for their political support. On May 11, 1896, H.R. 4058 was reported back from committee with the recommendation that it be passed, with three significant amendments. In Section 2, the maximum term of lease of lands on which to erect visitor accommodations was increased from ten to twenty-five years. Rights of way could be granted for the construction of railways or tramways through the forest reserve and into the park. And most important, a new Section 5 allowed mining in the forest reserve and the park. These concessions answered, in part, objections that the commissioner of the General Land Office and the secretary of the Interior had made to earlier versions of the Washington National Park bill. These three concessions to development pointed up the fact that the national park idea was now in competition with the new forest reserves, and that the Cleveland administration was definitely more inclined toward the latter type of land management regime. In hindsight, the creation of three new national parks in California in 1890 followed by the passage of the Forest Reserve Act of 1891 appear to mark, as NPS historian Barry Mackintosh has written, "the fork in the road beyond which national parks and national forests proceed separately." Each new national park entailed an act of Congress; each new forest reserve required only a stroke of the President's pen. To contemporaries, however, it was yet unclear how parks and reserves would differ from each other, if at all. John Muir, for one, hoped that the forest reserves would be managed in the same way as national parks. The well-known forester, Gifford Pinchot, meanwhile, argued that by placing the new forest reserves under scientific forestry management the federal government would obviate the need for national parks. In this context, park proponents thought the concession to mining was a small price to pay. It was more important to secure the federal government's recognition of Mount Rainier's extraordinary scenic and scientific interest so that, like Yellowstone, the area would receive a greater degree of protection. Even these concessions were not enough for some members of Congress who objected to the national park primarily on the basis of expense. Representative John F. Lacey of Iowa, chairman of the Committee on Public Lands, suggested that the national park designation was redundant since the area had already been withdrawn as a forest reserve. Representative Joseph W. Bailey of Texas thought the people of Washington should pay for the park's administration. When Doolittle suggested that the people of his state would "make the necessary improvements, for the benefit of all the people of the country" and only wanted assistance from the secretary of the Interior in protecting the area from vandals, Bailey reminded the Congress of the cost of administering Yellowstone, and sarcastically noted, "the difficulty I have is that I have not learned how it is possible to maintain a park by any government without expense." He then obtained Doolittle's assurance that the Washington congressman would not "ask a dollar from the Government in the way of an appropriation." With that, Bailey withdrew his objection and the bill was passed. With the three amendments duly approved by the House, H.R.4058 came very close to the final form of the Mount Rainier National Park Act. But the progress of the bill through Congress was slow. On June 10, 1896, the Senate referred the bill to the Committee on Forest Reservations and Protection of Game. Eight months later, on February 17, 1897, the bill was reported back with the recommendation that it be passed without amendment. In March it passed the Senate only to be pocket vetoed by President Cleveland as he left office. Senator John L. Wilson introduced an identical bill (S.349) in the next session of Congress, but apparently because no companion bill was introduced in the House, it never returned from committee. On December 7, 1897, Wilson introduced the same bill in the next session of Congress (S.2552), and one week later Representative Wesley Jones introduced a Washington National Park bill in the House (H.R.5024). As this bill became stalled in the Committee on Public Lands, Representative Lewis introduced the same bill again (H.R.9146) on March 14, 1898. Finally, in February 1899, the bill reached one final snag. The story of the bill's final hurdle comes from Seattle businessman John P. Hartman, who later claimed to have been closely involved in drafting the legislation. This seems unlikely, since Hartman's account begins not with Doolittle but with Wilson and Lewis in 1897. In any case, Wilson and Lewis summoned Hartman to Washington, D.C. in order to help them overcome the objection of the powerful speaker of the House, "Uncle Joe" Cannon. I reached the National Capitol [sic] early in February, and very shortly was ushered into the presence of Mr. Cannon, piloted by Colonel Lewis. As usual, Mr. Cannon was smoking his big, black cigar, ensconsed in a swivel chair, with his feet on the jamb above the little fireplace where coal was burning cheerily in the grate. After preliminaries Mr. Cannon said, addressing me, "I have a notion to kill your Bill, and I have the power to do it." Of course, I wanted to know the reasons and he said, "It is all right to set these places aside but for the fact that in a year or so you will be coming back here seeking money from the Treasury to improve the place, and make it possible for visitors to go there, which things we do not need, and we haven't the money therefor, and I think I will kill it." I said to Mr. Cannon, "I promise you, Sir, that if this Bill is passed I will not be here asking for money from the Federal Treasury to operate the place so long as you shall remain in Congress." With that statement, he said, "I will take you at your word and let the measure go through, if otherwise it can travel the thorny road." Shortly after this meeting the bill was reported back and the House passed one minor amendment recommended by Lewis, which gave settlers in the national park the same right as the railroad to claim other public lands in lieu of their lands in the park. In a final amendment, the House dispensed with the politically sensitive but dull "Washington National Park" and named the new national park after the mountain. (Ironically, it was misspelled Mount Ranier National Park.) The bill passed both houses of Congress on March 1, and was signed by President McKinley on March 2, 1899. Despite its flaws, the Mount Rainier National Park Act was an important triumph for the national park idea. With Yosemite, Sequoia, and General Grant all designated as "forest reserve lands" even though the legislative intent was that they be administered as national parks, and with the future of a national park system called into question by the Forest Reserve Act of 1891, Mount Rainier stands as the first national park to be modelled unambiguously after the prototype Yellowstone National Park. The creation of Mount Rainier National Park resolved any lingering doubts that the nation would develop two distinct systems for preserving its natural heritage.